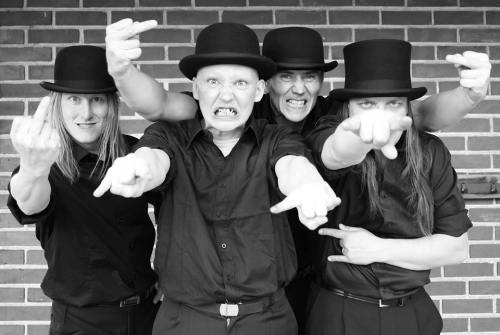 If you haven't at least heard of cult Finnish band Unholy, and their bizarrely unorthodox quartet of '90s album releases, then Comrade Aleks's retrospective interview should come as a welcome introduction. And if you have, perhaps it'll be an equally welcome reminder of their achievements. "We've done a few retrospective interviews during the last two years with long disbanded bands such as Morgion and Visceral Evisceration, amongst others. I believe it's the right thing to do, reminding people about key bands from the past, and - of course - the Finnish Unholy is amongst them. It's hard to tag them as a hugely influential band, but at some point their recognizable dark sound became a kind of trademark. Born thirty years ago as Holy Hell, Unholy existed through three periods: 1990-1994, when the cult albums 'From The Shadows' and 'The Second Ring Of Power' were recorded, 1996-2002, when the band developed these ideas through two further records, 'Rapture' and 'Gracefallen', and 2009-2012, when Unholy reunited in order to play a few live gigs. We had a talk with the band's original guitarist and keyboards player Ismo Toivonen." Talking to Aleks today, Unholy's guitarist/keyboardist Ismo Toivonen. Photo: Marco Manzi. Hi Ismo! Thanks for your time, it's much appreciated! So the band was started under the name Holy Hell in 1988. What made you take your guitar in hand back then? I had played guitar and bass already for a few years by then, additionally with violin and piano. I guess it's every youngster's dream to be a rock star, so that pushed me forward. I already had a few garage bands with some other guys by then, and we also had played with Jarkko (my cousin, not brother as it is told somewhere) and Pasi occasionally for a while already. I was not officially in the band in '88. I joined after the Kill Jesus demo. The reason for that was quite funny, I didn't have a good enough amplifier before that. The band changed the name to Unholy, and over two years you recorded four demos - how did you work out your vision of Death Doom metal? What kind of stuff did you actually aim to play? It actually changed right after the Kill Jesus demo. We wanted to be heavier than other bands, because I think none of us liked traditional death/speed metal. Celtic Frost and Black Sabbath were some kind of idols to us. But we liked bands like Voivod and Coroner too, so the result was some kind of mix from those two. But we didn't consciously try to copy any bands, actually it was more like that we wanted to AVOID taking too much influence from other bands. As a part of that, we listened to very different music in our personal lives, like Pink Floyd, Led Zeppelin, classical stuff like Schnittke, Bach etc. So it was in the end a mixture of many things. The only conscious idea was to play heavy stuff. The core Unholy line-up: Pasi Äijö (Vocals, Bass), Jan Kuhanen (Drums), Ismo Toivonen (Guitar, Keyboards) and Jarkko Toivonen (Guitar). 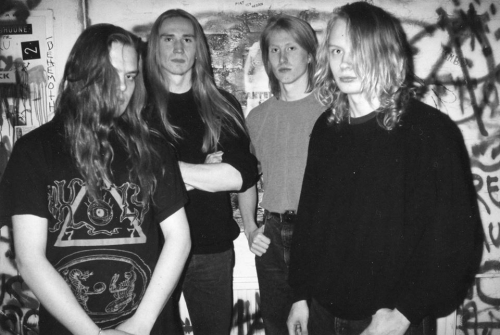 The band was founded in Imatra, and that's a pretty small town: was it a problem back then to be a metalhead there? Did you play gigs there? It was not any harder than being any other kind of band. We had luck to have a good rehearsal place from the commune, where we actually stayed for about 5 years. Those were the years when the base of the band was built, and first two albums were released. So I wouldn't say it was too hard. Yeah, we played some gigs in Imatra and near cities in first years, but started to play more live shows in the early '90s. Anyway it was quite small scale action, to be honest. Unholy was not a very good live band for a random audience that was just coming to see metal music and bang their heads. There were much better live bands in that time like Xysma, Impaled Nazarene, Beherit etc. Unholy is hard music to play live in an interesting way. In later years when people would intentionally came to watch Unholy, it would have worked better. But the irony was that in those years we had either no band or no suitable live line-up. I'm talking about the years '94-'99. We got the line-up to "live condition" in 1999 and that was already too late because those times were not good for indie metal. 'From the Shadows' was recorded in Vienna, how did you get there? And how much time did you have in the studio? Were you limited with time? How did you organize this session? Label wanted us to record it there. I still don't know why, because if they saved some studio costs with friend relationships that money was burned on hotel costs. So that was a really stupid thing, but it was a fun time for us. Very interesting weeks of my life. I don't even remember how long time we were in there, honestly. : ) I think a few weeks. Sessions were organized very badly really. Everything was run by Lethal Records, so we just played in the daytime and drink and smoked after it. When it was time to mix the album, then I think the label ran out of studio time. You can hear it from that "legendary sound" of From The Shadows. They just told us they would mix it afterwards, but the result we got in the final album was exactly the same as we got with us as "raw mix-version". Can you say that the release of 'From the Shadows' brought you recognition? How did you feel about it? I was never happy about the album sound. It sounded so amateur in some way… But that sound was giving it some kind of cult status, and it was ok from that point of view. But all I was waiting for was to get to write some new music and to get a contract from a better label. Band picture from 'From The Shadows'. 'The Second Ring Of Power' was already released by 1994, there was just one year between these albums. Did you know from the start in which direction you wanted to move with it? Yes, we wanted keyboards to play a bigger part of the music, so I moved to full time keyboardist. 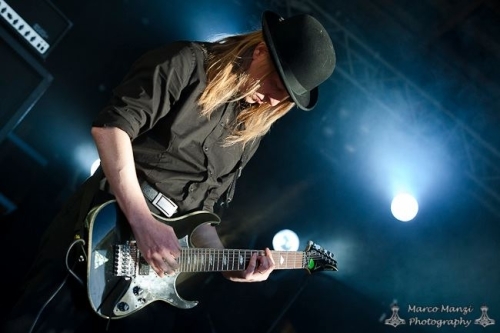 We never really used two guitars to make the music deeper and arrangements wiser, as we should have, like for example Katatonia was doing in later years. So a one guitar lineup was good decision. Keyboards brought some new ideas and perspectives to our music, and kind of matured our sound. This album was recorded in Music Bros Studios in your home town, how did this session differ from the one you had on 'From The Shadows'? It was completely different. We had highly professional studio staff available, and it was easier to do the job without having to be on the road all the time. Sleep in our own beds etc. And studio was technically better. 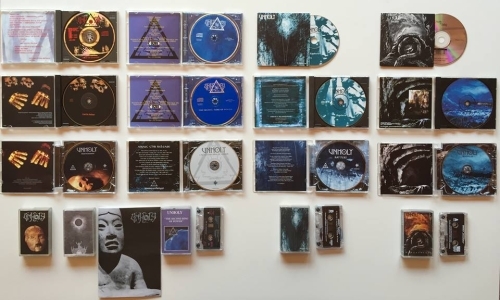 Unholy's catalogue, in various official and bootleg formats. I'd say that Unholy always produced not just a depressive but also a spiritual vibe. How serious were you, considering the song lyrics and overall image? Was it just an instrument to keep the band's dark musical vibe, or did you truly believe in what you performed? I haven't written any lyrics except one, so I'm probably the wrong guy to comment on that. But I THINK the early time lyrics were some kind of manifesto to underline the speciality of the band by handling topics that cause conflicts with normal people and also with the basic black metal genre. We were young. But sure those who wrote them believed in it: Jarkko's studies in philosophy and satanistic topics, and Pasi's ideas of human minds and development of society were seen strongly in those times. I personally find Jan's lyrics the most interesting! They don't try to underline any personal intelligence or superiority of writer, as philosophical topics usually do, but still are really intelligent and lyrically very very beautiful, telling stories about the human mind's uniqueness and life itself, hidden inside philosophical skin. If you listen to lyrics of "Of Tragedy", "Immaculate" or "Athene Noctua", you see my point. It's said that Unholy was disbanded in 1994, so there was almost four years between 'Second Ring Of Power' and 'Rapture'. What made you return to Unholy? It was actually only 18 months inactive time, but of course if you look at the discography, it looks like 4 years. I have told that story so many times, and it is even written in the band history on official website unholy.fi so I don't feel it necessary to repeat now. How do you see your progress on the 'Rapture' album? How natural were these changes in the sound? I had a feeling that I wanted to make an album that was even more radical than From The Shadows was. So I turned everything to a more minimalistic direction. I wrote Wretched during the band's inactivity. So I wrote that song basically for nobody, because there was no band. I had no idea what band would play that. Unzeitgeist was also from that time period. But after we got back together and Jan heard those songs, he wanted them on the album. They were not very nice songs, but we didn't care. Good songs yeah, but not nice. So we kind of decided to make an album that spits on the listeners face! I even got rid of traditional guitar solos, writing them to be more like part of the song itself. I think Rapture is the heaviest and the most minimalistic album from Unholy. However, if I would arrange it today again, I would make some changes to it. Maybe it was too extreme even to myself! A lot of musicians recall the '90s as a golden age of extreme metal, with paper magazines, gigs, tape trading and other old-school stuff. Did you go through all of this with Unholy? Do you feel a nostalgia for that period? Personally no! I was never interested in what happened in the genre. I had no friends from other bands etc. It was more like Jarkko's interest to trade tapes and having contacts with guys from other bands. Maybe that was one of the reason why we didn't have many contacts in genre in the later 90's (without Jarkko) when we tried to get a foothold in gig organizers rosters. So we failed to get live playing started on a bigger scale, even though we had a good lineup for that in 1999 and we played better than ever before. It was also a bad time period for underground metal for sure. But that was basically one of the reasons in the background why we decided to split up in 2002. You couldn't get your name in popularity without gigs, and you couldn't get contracts with big labels without popularity. 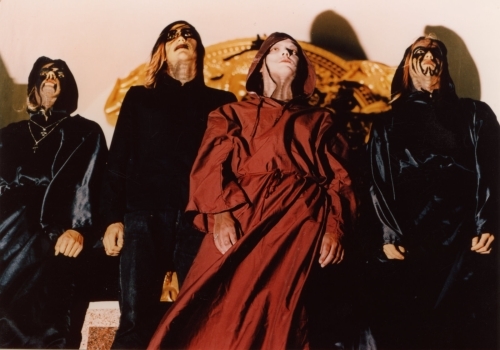 The band in last-reunion era. Do you feel that back then Unholy was an influential outfit? Was it fun to be a member of such a band as Unholy? I didn't think it like that. I never take anything to very deep in my feelings. I'm more like a reasoning mind. Jarkko has told later that maybe things got out of control in those times from him. It kind of came up for him. For me it was just about playing and having fun with a bunch of nice guys. But yeah, of course it was nice to be in a band that people were considering as some kind of cult band, even if that group of people was (and is) very small in global scale. How do you see the place of 'Gracefallen' in Unholy's discography? Was it something innovative personally for you? Do you feel that it was your last album with Unholy? For me Gracefallen was and is the album I always wanted to do. It was some kind of singularity of Unholy products so far. The most melancholic album maybe written ever, and it almost makes me cry every time I listen to it. Hard to believe it's mostly written by me! So I have a very deep spiritual connection to that album and the themes it covers. It's the album where it's still, even today, almost impossible to find something that I would do differently. I love that album! Therefore it was so difficult to continue song writing after Gracefallen. That path was kind of walked to the end. There was nothing to add, the perfect doom album was there. So we decided to start to develop a completely different direction. It would have been nice to see where that path would have led, but conditions were against us. New Unholy was some kind of melancholic, psychedelic jazz rock. We even had songs that didn't have distorted guitars at all, but still they were not ballads. You can imagine how that would have shaken the doom metal genre, and what kind of traitors we would be considered amongst some old fans, but that direction was – maybe just because of that – taken intentionally. It is probably the last album, yes. Didn't the reunion in 2009-2012 motivate you enough to continue writing music as Unholy? We didn't have time. We had families, jobs, studies etc. Playing old stuff is one thing, but writing new music is completely different. How would you sum up the ultimate message of Unholy? I cannot say anything that would not sound lame/stupid. But maybe that's the message: If you have nothing else to say but something someone else has already said, then say nothing. Interviewed on 2018-07-29 by Comrade Aleks Evdokimov.